I’ve lived long enough to have experienced the dispersal of information about plants move from paper to the computer screen, and it seems I rarely have the sense anymore that I’m cut off from an essential stream of information on one of my favorite topics. But in other important cultural, scientific, and political matters, I often feel that with the digital floodgates open on seemingly every topic and opinion, many vital issues fall prey to a lack of inflection or emphasis and are thereby deemed irrelevant in the popular imagination. Yes, platforms like the TED talks help give marginally popular issues a voice, but for those of us always scanning the sky, the land, thermometers and rain gauges, I do feel our concerns are woefully underrepresented in popular media. And what’s incredibly frustrating is that these concerns of ours are not narrowly personal but important and central to everything we love (life!). So when programming like Natural Discourse came along back in 2012, I immediately sensed this is the focus that’s been lacking. 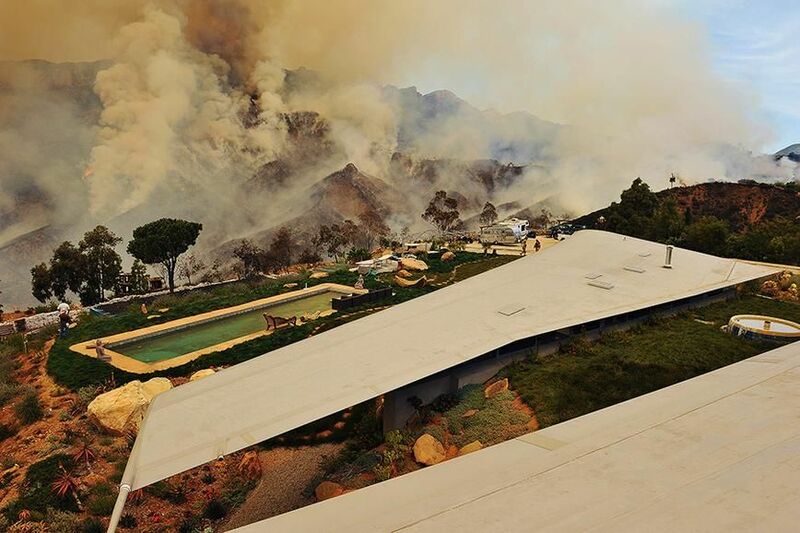 Photo above taken by photographer George Bennett, when fire was threatening the 747 Wing House in the Malibu hills. The house, designed by architect David Hertz from the wings of a decommissioned Boeing 747, is on the site of Tony Duquette’s Ranch, which itself was destroyed in a brush fire in the 1990’s. When fire was menacing the Wing House in 2013, George was on site with his camera. He has been invited him to show us these stunning images and recount this close brush with destruction. John Doyle, Jean-Lou Chameau Professor of Control and Dynamical Systems at Caltech. His talk Fire and Life, will highlight Southern California’s particularly complex relationship with fire. Thomas Fenn, Director of the Yale Center for the Study of Ancient Pyro-technology. Tom is an archaeologist who specializes in examining early technologies. His research combines chemistry, geology, archeology, cultural anthropology and history. He will talk to us about the history of man’s discovery and use of fire. George Bennett, photographer, will talk about fire at the Wing House in Malibu Erica Newman, fire ecologist will talk about biodiversity in chaparral and what to expect with fire and climate change. William L. Fox, Director of the Center for Art + Environment at the Nevada Museum of Art, will talk about fire as an outdoor spectacle and as art in the environment. Sara Hiner, musician and Eric Elias, pyro-technician, will talk about their collaboration on the fireworks at Hollywood Bowl. Mark Briggs, river ecologist with the World Wildlife Fund’s Rio Grande/Bravo Programs will talk about controlled burns on the US/Mexican border. I do think it’s incredibly important to support this unique programming (written in my best, silkiest NPR/PBS-solicitous voice), and it’s just been made easier to do so. Prices have been reduced; tickets can be ordered here. Los Angeles, if ever there was a discourse designed specifically with you in mind, this is it. Come support Natural Discourse. I’d love to see you there. This entry was posted in artists, climate, Department of Instruction, design, garden travel, garden visit, science, shop talk and tagged Natural Discourse: Fire! (2016), The Huntington Library. Bookmark the permalink. Excellent, Jane! I can drive/carpool anyone near Long Beach and environs. Denise, I’m so looking forward to this. Thank you again! Hope to see you and Jane (who has also volunteered as a fire lookout, I learned today) this Friday at the Huntington.